Parents - they are such wet blankets! 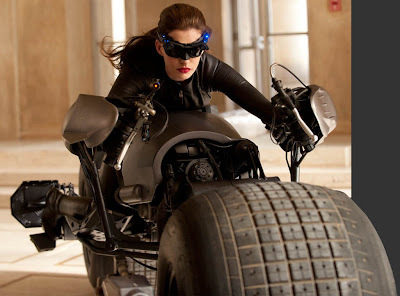 I know if I had a Bat-pod I'd never be aloud to ride it indoors, but Anne Hathaway, kittened out as Selina Kyle for the upcoming flick The Dark Knight Rises, shows no such parental restriction. While the semi-doctored version of the official Warner Bros image is above, the below from SpoilerTV shows a bit more of the thigh-high boot wearing cat-burglar - this time though of Anne's stunt-double. Racing down the steps of Pittsburgh's Mellon Institute of Industrial Research, the building doubles as Gotham City Hall for the film which opens July 20, 2012. With nine lives hidden somewhere up her skin-tight sleeves, could this 'Catwoman' spin-off into her own film, after the Batman/Nolan trilogy ends? All fans still exorcising the Halle Berry Catwoman movie from their minds plead the affirmative. She is looking surprisingly awesome in this Catwoman look. Yeah ah I think there are a few people who weren't expecting her to pull it off!